When we were in Italy, what struck me most is that there truly isn’t “Italian” food. Rather, their food is identified by the region you are in. Spaghetti and clams in the Italian Riviera. Boar in Tuscany. Pizza in Naples. That is why I was so intrigued when I saw a recipe for Sicilian meatballs in Bon Appetit. The food of Sicily has a Greek and sometimes African influence, making it have more olives, capers and currants than you would find in the “boot.” So when looking at the meatball recipe, at first glance it seemed very traditional. Sausage meat (which was an interesting twist on the typical beef, veal, pork combo), breadcrumbs in milk, garlic, onion, etc. Yet, then they add pine nuts and currants to make it have a bit of nutty sweetness. They are baked, and then smothered in a traditional Italian red sauce. This dish has that same warm, comforting result as typical Italian meatballs, but they do have an interesting sweetness to them that makes them have a “hmm, what’s that?” factor. 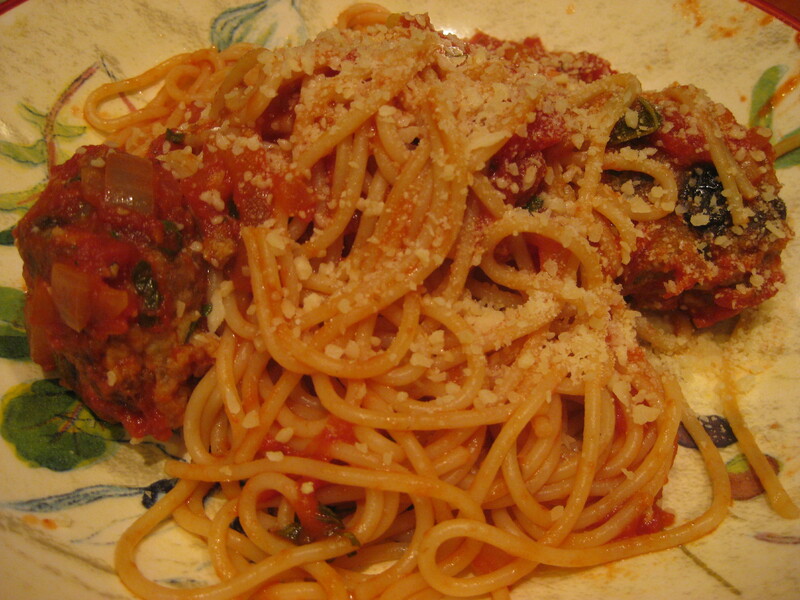 It is a great alternative to a typical bowl of spaghetti and meatballs, and will be making its way to our dinner table as a great Sicilian (not Italian!) dish! Heat oil in heavy large pot over medium-low heat. Add onion; sauté until golden, about 10 minutes. Add garlic; stir 1 minute. Add tomatoes with juices and 2 tablespoons basil; bring to boil. Reduce heat; simmer until sauce thickens, breaking up tomatoes with fork, about 1 hour. Mix in 2 tablespoons basil. Season with salt and pepper. Set sauce aside. Preheat oven to 350°F. Lightly oil baking sheet. Mix crumbs and milk in medium bowl; let stand 5 minutes. Mix in Parmesan, onion, basil, egg, garlic and pepper. Add sausage, pine nuts and currants; blend well. Using wet hands, form mixture into 1 1/4-inch balls. Place on baking sheet. 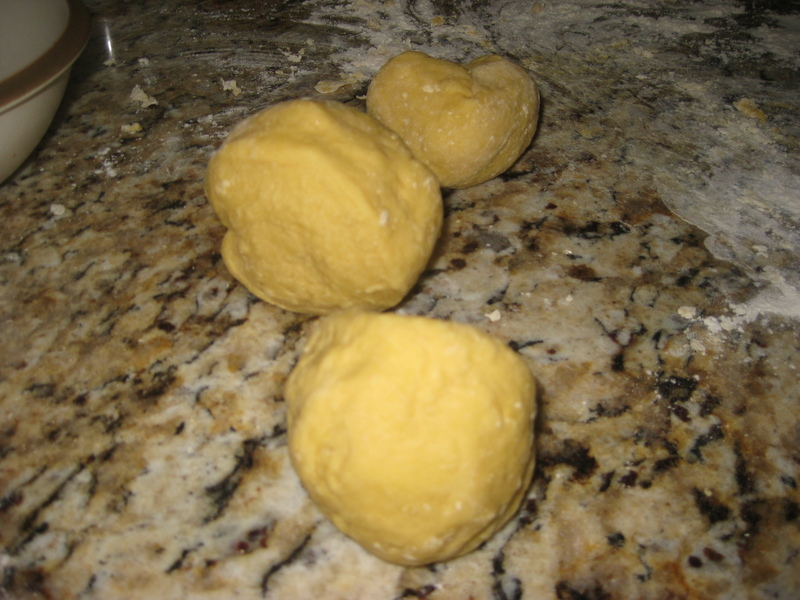 Bake until meatballs are light brown and cooked through, about 30 minutes. Add to sauce. Cook spaghetti in large pot of boiling salted water until just tender but still firm to bite. Drain. Mound in dish. Bring sauce and meatballs to simmer. Mix with and spoon over spaghetti. 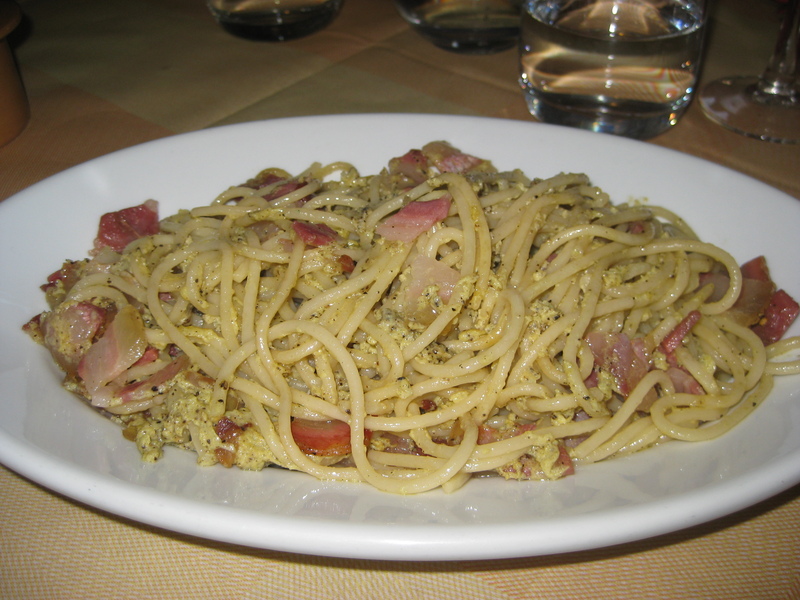 For those who have been reading this blog, there is no need to reiterate my love for carbonara. When you put pasta and bacon together, let’s face it, you just can’t go wrong. It isn’t surprising that when we spent a few weeks in Italy last spring, this was the dish I was seeking out most. It is more common in the Umbria and Rome area (although you can find it many other places). So I knew when we arrived in that region, I wouldn’t need to look at menus very long. We had spent a few days in our Villa by Spoleto and had decided to take a side trip to the religious mecca of Assisi (45 minutes away). It is a beautiful town, filled with amazing stone buildings, commanding views, and a spiritual aura. We had just visited Minerva and someone must have been scouring down on me because (I am convinced), because it was the one time on the whole trip that I didn’t cover my shoulders in the church. As we exited the building and went down the marble steps my clumsy feet just couldn’t get it together – and I slipped down the stairs. O Madon! No matter what country you are in – when you fall onto marble, it hurts like nobody’s business. So, after going to the pharmacia and showing the clerk, who got us appropriate bandages and some neosporin looking stuff (at least we think that is what it was), I needed a pick me up. My husband joked that for me, carbonara, a glass of wine and a scoop of gelato will make anything better! (the truth is, he is right!) So we set out down some less traveled paths to find the perfect resting place. We saw a little restaurant, unassuming and filled with locals, and knew we had found the place. This was my first official carbonara of the trip and I barely needed to look at a menu to know what I would have. I took one bite and knew it was the best carbonara I had ever tasted in my whole life. The sauce wasn’t overly creamy, it had an amazing saltiness, and was filled with pancetta. There was something intangible in that dish – something that set it apart. Not sure if it was the state of shock I was in from my fall, the glass of wine I had to wash down lunch or the food itself. So, when I started seeking out the perfect carbonara recipe upon my return, I did lots of research on the traditional way Italians make it. Much to my surprise, a common ingredient is anchovies – and I knew at that moment that it was the little fish that had made it into my dish that day. Now, my husband claims to not like anchovies, yet I knew when you cook them in olive oil they actually disintegrate so you don’t bite into them, yet they infuse your sauce. So, I gave it a whirl. Hands down it was the best carbonara I have had outside of Italy. I made my own tagliatelle (my new favorite past time) but you could surely use any spaghetti or fettuccine you would like. I also added a bit of pancetta – because let’s face it, everything is better with pancetta. So nothing can quite compare to the throbbing pain in my knee, the refreshing wine out of a jug, the views of St Francis and the Italian language surrounding me. But, this dish at least transports me, just a little bit, to the land that invented carbonara. 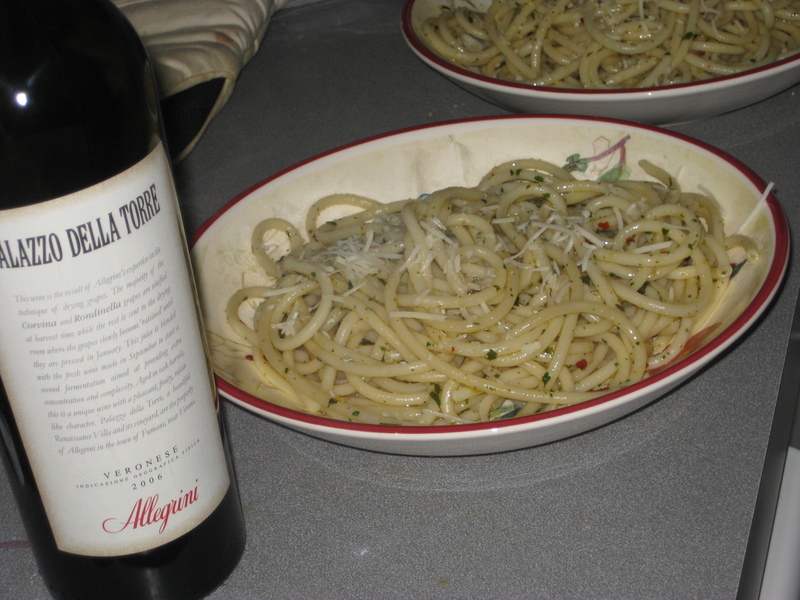 Thanks to Food and Wine for this amazing rendition of an Italian classic. If you don’t like anchovies, still give it a whirl – just cut back on the amount a bit. They might just surprise you! In a large pot of salted boiling water, cook the spaghetti until al dente. Drain the pasta, reserving 1/2 cup of the cooking water. In a large, deep skillet, heat the oil with the garlic and anchovies and cook over moderately high heat until the anchovies have dissolved, about 2 minutes. (If using pancetta, add and cook until cooked through.) Add the red pepper, zest, oregano and parsley, then add the pasta and toss to coat. Remove from the heat. 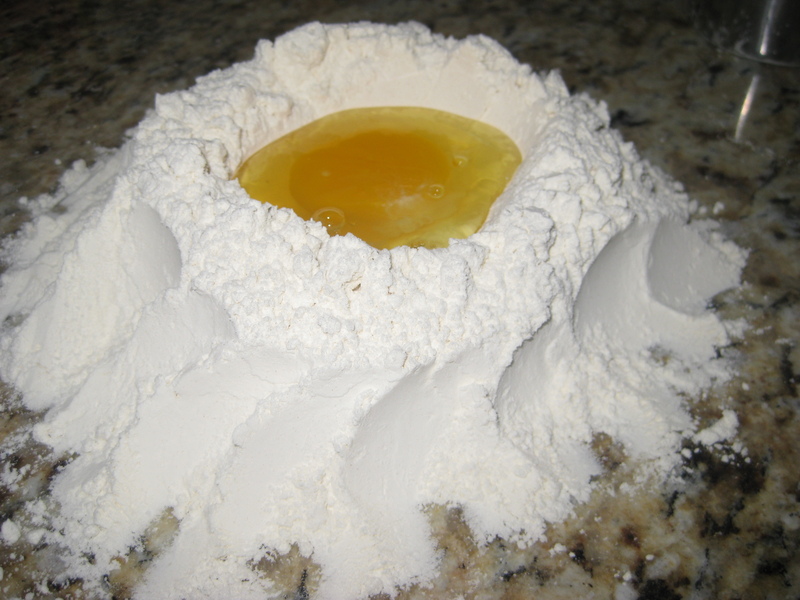 In a small bowl, whisk the yolks with the reserved cooking water and add to the pasta. Cook over low heat, tossing until the pasta is coated in a creamy sauce, about 1 minute. Season with salt and pepper and serve. 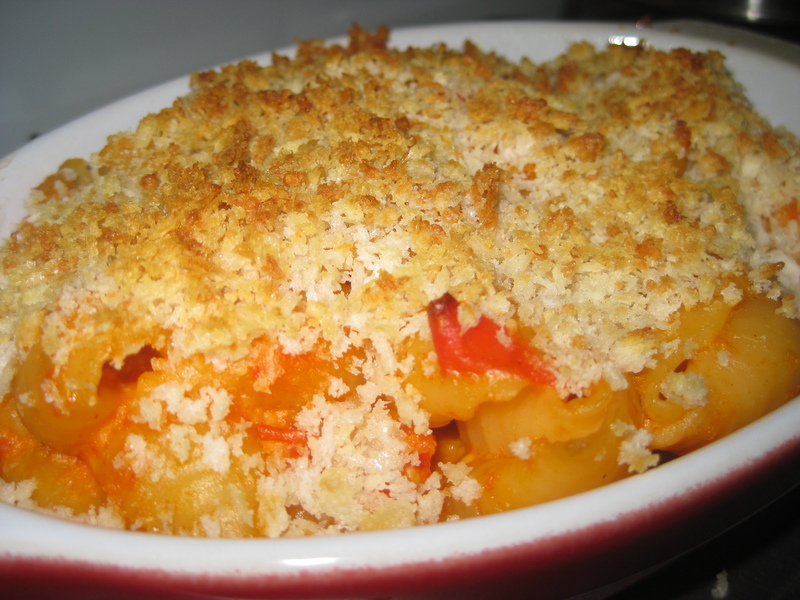 So it is surprising, really, that I only have one version of mac and cheese on my blog so far. 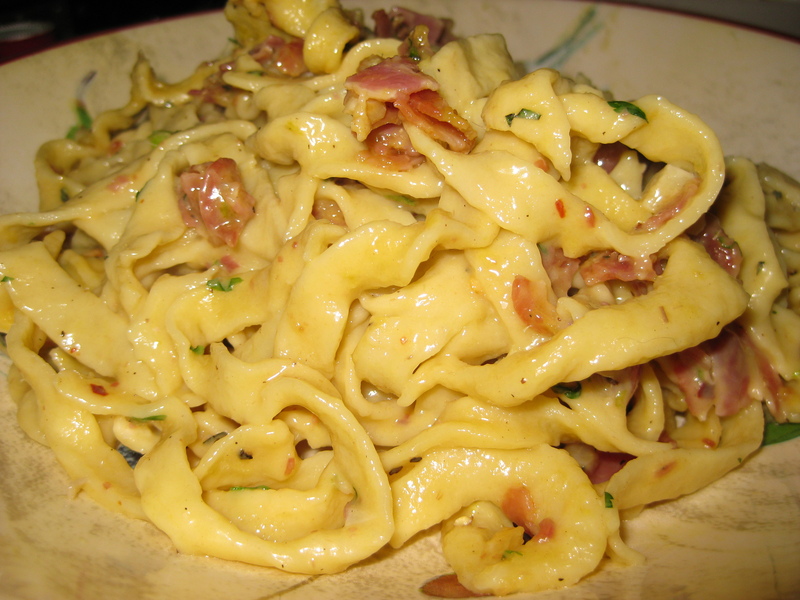 It has always been a go to – many types of cheeses with the salty richness of pancetta. But when I saw this unique version from Bon Appetit, I thought I would try it in hopes of finding another treat for the days I need a pick me up. Oh. My. Goodness. There is something in this dish that is special – not your average mac and cheese. Yet it isn’t so gourmet that it loses the simple heartiness that makes the dish what it is. You taste this amazing pimento flavor, with a hint of heat and rich, gooey cheese. Peppadew peppers are easy to find once you know where to look. In my grocery store they were with the pickles – but check around for where they might be at your store. 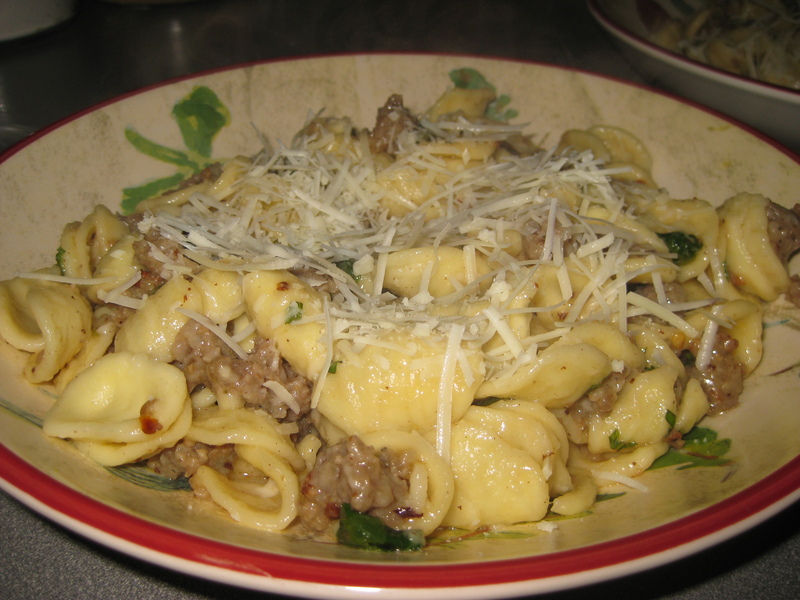 There is something about the shells vs. elbows, as well, that really catch the rich sauce. So, next time I have a bad day, the skies open up with some nasty weather or I just want to eat an amazing dinner, this one will be on my list. Bring 1/2 cup water, bell pepper, and 11/2 garlic cloves to boil in small saucepan. Cover; reduce heat to medium-low. Simmer until pepper is soft, about 15 minutes. Toast panko in skillet over medium-high heat until golden, stirring often, 5 to 6 minutes. Transfer to bowl; cool to lukewarm. Rub 1 tablespoon butter into crumbs to coat. Mix in 1/4 cup Parmesan. Preheat oven to 400°F. Butter 8-cup baking dish (or 6 individual dishes). Cook pasta in pot of boiling salted water until tender but still firm to bite. Drain; return to pot. Stir sauce and mozzarella into pasta. Season with salt and pepper. Spoon pasta into dish. Sprinkle with crumb topping. 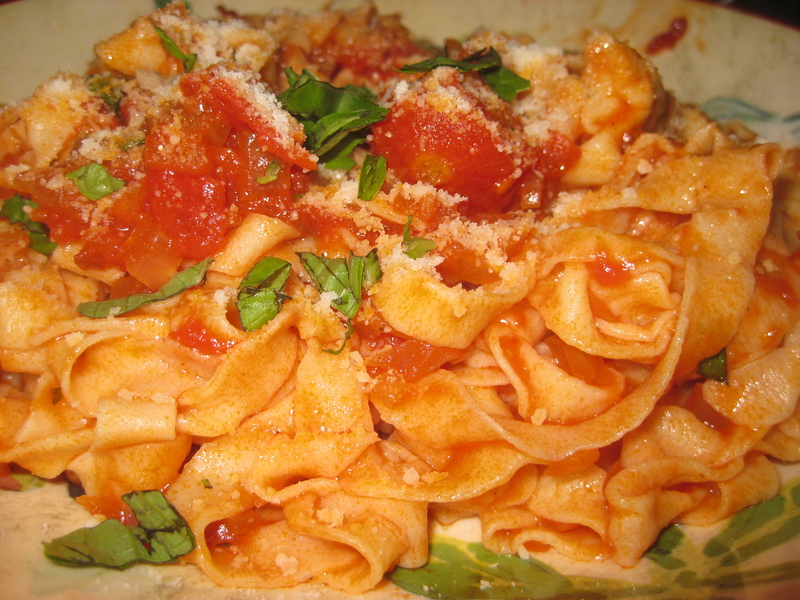 Bake pasta until topping is crisp and sauce is bubbling, about 25 minutes (15 for individual). Let stand 10 minutes. Until spending time in Cinque Terre, Italy, I hadn’t had much pesto in my life. Not sure if it was the intimidating color, the name’s meaning (means “to pound,” yikes!) 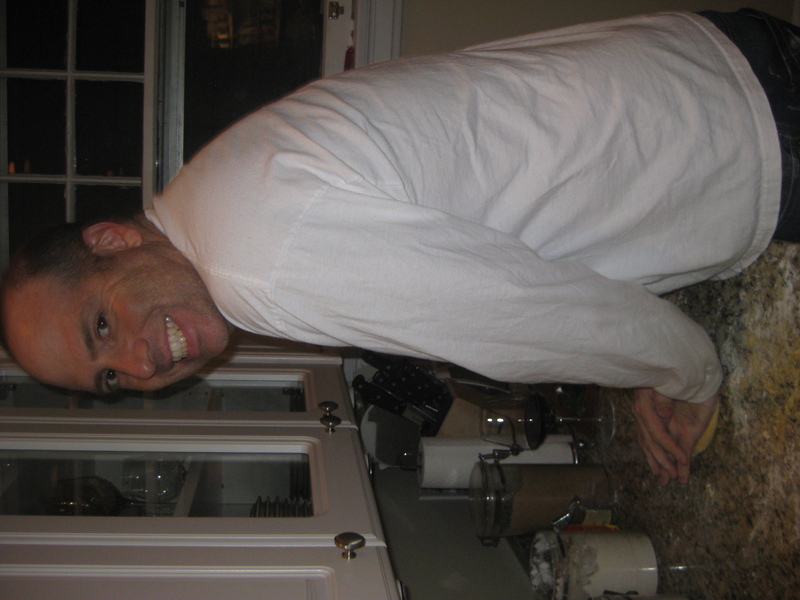 or the fact that my husband claimed he was never a big pesto fan. Yet, on our first night in Vernazza, sitting at a restaurant on the sea, we followed an antipasti plate of fresh fish with a big, heaping bowl of spaghetti topped with the greenest, freshest, most flavorful sauce I have never had. And it was, of course, pesto. As you can imagine, upon returning from the trip when I contemplated making my own pesto, I had no arguments from my husband. We had found a new love and new appreciation for this sauce that originates in the Ligurian coast of Italy. I pulled this recipe from La Cucina Italiana (have I mentioned I am obsessed with this magazine?). Seemed simple and authentic – pine nuts, basil, parmigiano reggiano and pecorino romano, garlic, sea salt and olive oil. But the mistake I made was trying to make it the authentic way – without authentic tools. Pesto is made is a mortar and pestle. Why not? If that is how the Italians do it, then that is how I will do it. The small problem (well big problem) was, that I didn’t have one. My substitution was a muddler, and it was a sad replacement. So, alas, my pesto ended up in a food processor. The result tasted fantastic, but it made me put a mortar and pestle (authentic marble, of course) on my Christmas list so I can be a true Ligurian next time I indulge in this green goodness. Authentic tools or modern luxuries – either way I encourage you to try this simple sauce next you want to vary your color palate and your culinary palate. Place pine nuts in a medium skillet and heat over medium-low heat. Cook, occasionally shaking the pan back and forth over the heat, until nuts are toasted, 6 to 8 minutes. Transfer nuts to a plate to cool completely. Rinse basil and gently, but thoroughly, pat dry with paper towels. Place in a mortar with cooled pine nuts, garlic and pinch salt. Using the pestle with a rotary movement, grind ingredients against the wall of the mortar, until ground to a paste. Add both cheeses and grind into mixture to combine. Transfer mixture to a large bowl. In a slow and steady steam, add oil, whisking constantly. Pesto is best used the same day but keeps, its surface covered with a thin layer of olive oil and tightly covered, chilled, for 3 days. To dress pasta, dilute pesto with a tablespoon or two of pasta cooking water, toss with hot pasta (just cooked and drained), add a tablespoon or two of butter and toss again. Serve at once. I have to be honest, I always have a bit of sticker shock when I buy saffron. Spices themselves are quite pricy, but saffron normally runs over $10 and there is just a little envelope in the jar with a few strands of it. I know a little goes a long way, but does it really have to cost so much? So, I did a bit of research and – ok – I will admit, I think it should cost more than it does! The spice comes from the saffron crocus flower. A pound of dry saffron requires the styles and stigmas of 50,000-75,000 flowers – an equivalent of a football field’s area of cultivation! Forty hours of labor goes into 150,000 flowers (only 2 pounds of dry saffron). Ok, I get it. This stuff is tough and time-consuming to produce. I can see why the spice is $500+ per pound. So, I have a bit more appreciation when a recipe calls for a small amount of saffron – giving it a honey, grassy almost hay-like flavor (not to mention an amazing color). When I saw this pasta recipe in La Cucina Italiana, I thought I would try it, since I had never used saffron in pasta. I don’t know if it was the San Marzano tomatoes (essential! 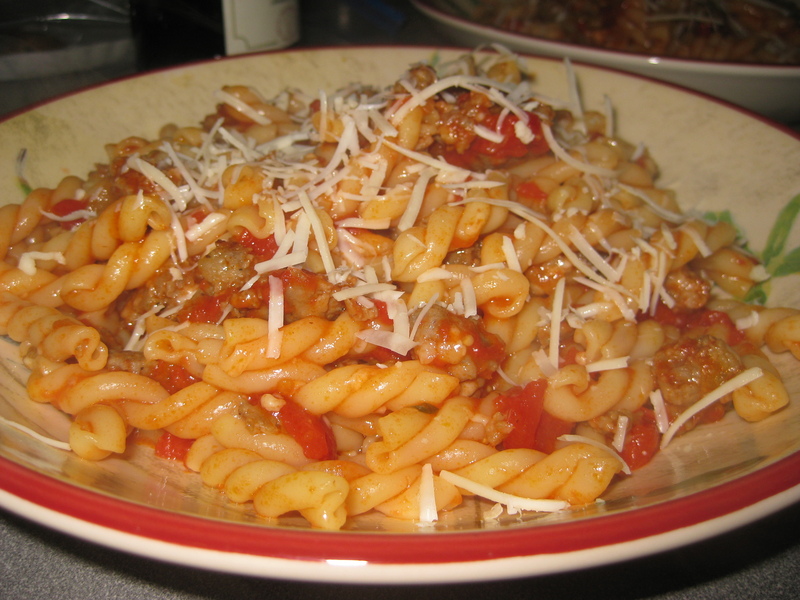 ), the unique shape of pasta (it called for malloreddus but I couldn’t find it so used gemelli instead), the sausage, or the amazing taste of saffron, but this pasta became one of my favorites in just one bite. There is so much favor – a spiciness (I added a few red pepper flakes) with the fennel in the sausage, that flavorful saffron taste along with the sweetness of the San Marzanos. Not to mention a great flavor and sweetness from the onions. So, next time you wonder why you are paying so much for saffron, remember the process to cultivate it, and make this pasta. One bite, and you just won’t care how much you spent to make it! Remove sausage from casing; break meat apart a bit. Combine saffron and 1/4 cup water in a small bowl. In a large saucepan, heat oil over medium-high heat; add onion and cook, stirring frequently, until softened, 5 to 6 minutes. Add sausage, reduce heat to medium and cook, breaking meat apart with a wooden spoon, for 5 minutes. Add tomatoes with juices and wine; cook, breaking up tomatoes, for 5 minutes. Add saffron mixture and 1/4 teaspoon salt. Gently simmer sauce until thickened and flavorful, 45 to 50 minutes. Remove from heat and cover to keep warm. Bring a large pot of salted water to a boil. 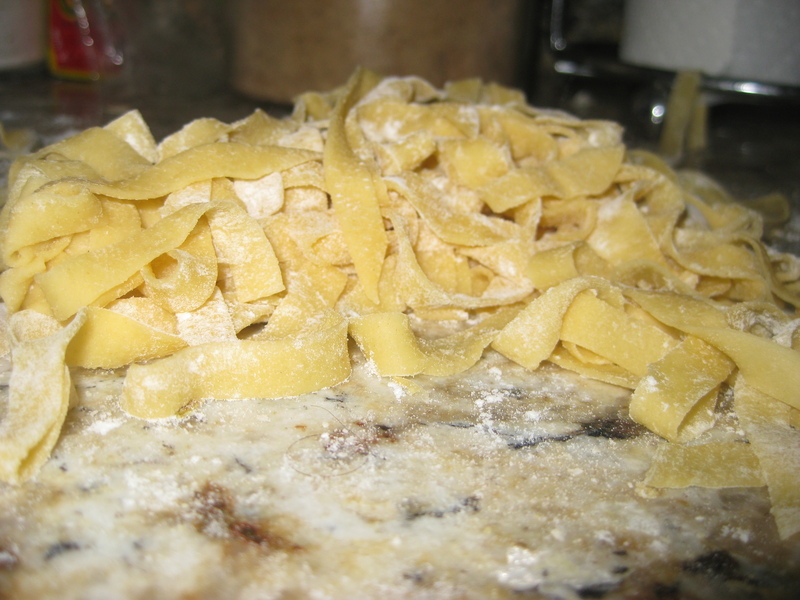 Add pasta and cook until al dente (about 6 minutes after water returns to a boil for fresh malloreddus). Meanwhile, gently warm sauce. When pasta is al dente, drain pasta, transfer to a large bowl, immediately add sauce and toss to combine. Add cheese and toss once more. Serve immediately, passing extra cheese at the table. Ever since spending time in Italy, I have found a true love for bucatini. I have written about it in other recipes, and there is a reason – it is a heavier noodle, because of the hole, and if you have a sauce, it gets caught in the middle, giving the dish more flavor. 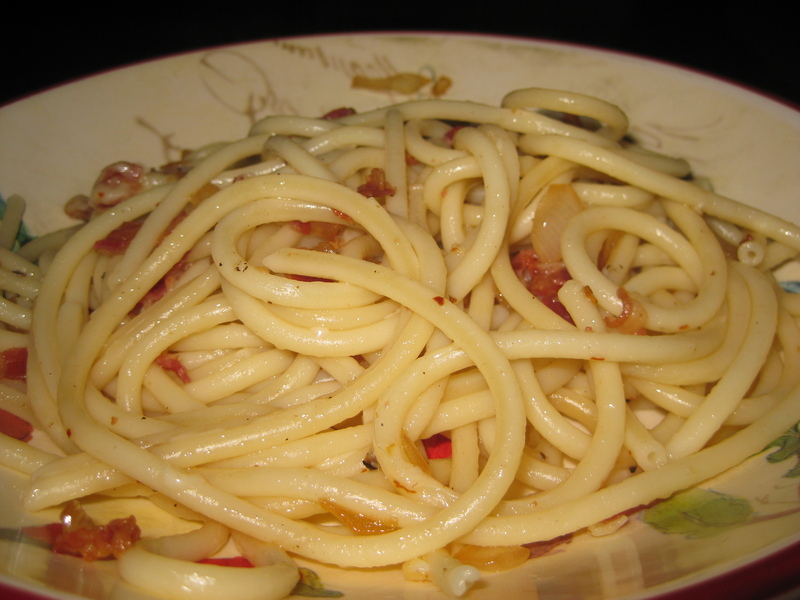 Now, this particular dish could be made with spaghetti, of course, but I just love the bucatini for something different. 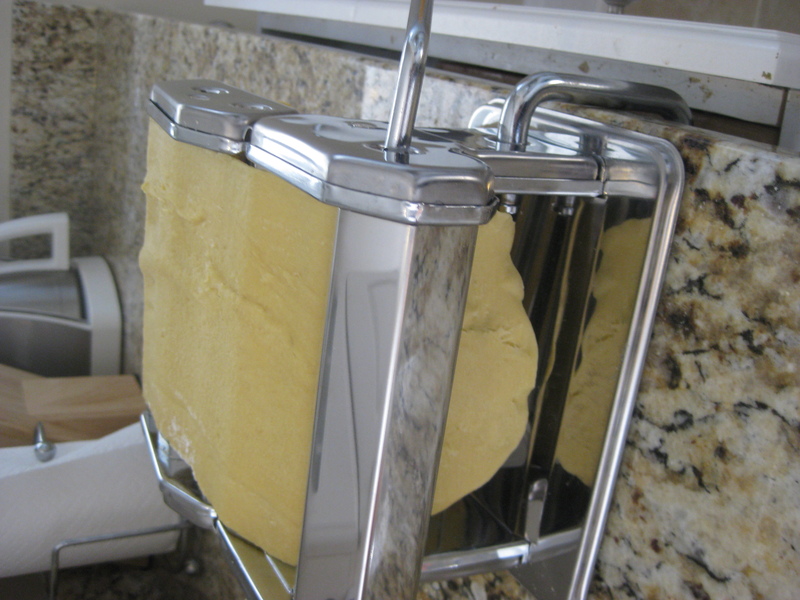 I got this recipe from one of my favorite magazines – La Cucina Italiana. 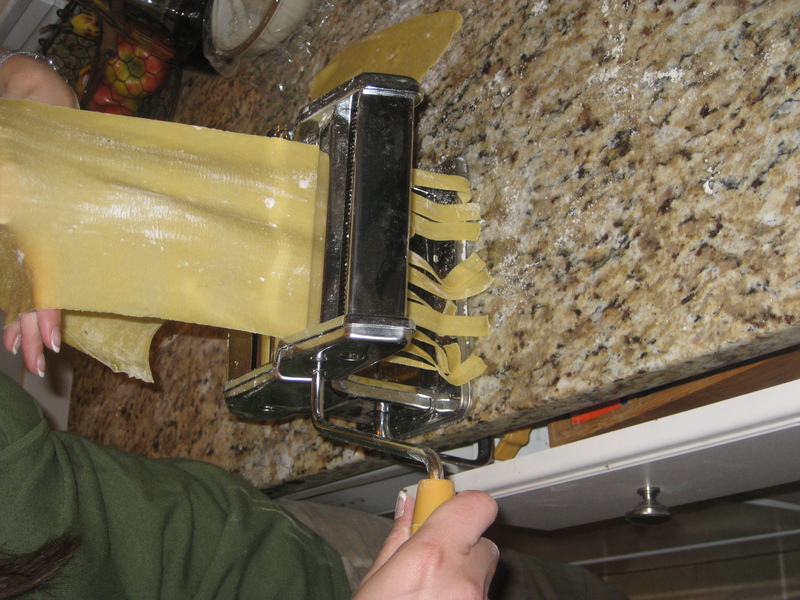 It was a “pasta issue” so I am sure you will be seeing some more pastas soon. I would love to say I made this recipe with guanciale, but it is a tough find here in Cincinnati (if anyone knows where to get it, let me know!) so I substituted the good old standby – pancetta. I will admit, this is a pretty basic recipe, but is a great one if you want something a bit lighter (no heavy sauce) and something full of flavor! Bring a large pot of salted water to a boil. Meanwhile, cut guanciale into 3/4-inch pieces. Line a plate with paper towers. Combine guanciale and oil in a large nonstick skillet; cook over medium heat, stirring occasionally, until golden and crisp, about 5 minutes. Remove skillet from heat. Using a slotted spoon, transfer guanciale to paper towels to drain. Add onion and chiles (red pepper flakes) to skillet; cook, stirring occasionally, until onion is softened, 5 to 7 minutes. Meanwhile, cook pasta in the boiling water until al dente. Return guanciale to skillet and stir to combine; remove from heat. When pasta is al dente, drain pasta and immediately return to pot. Add guanciale mixture, scraping skillet with a rubber spatula to add all of the pan contents to pot with the pasta. Toss to combine. Add cheese and toss once more. Serve immediately. 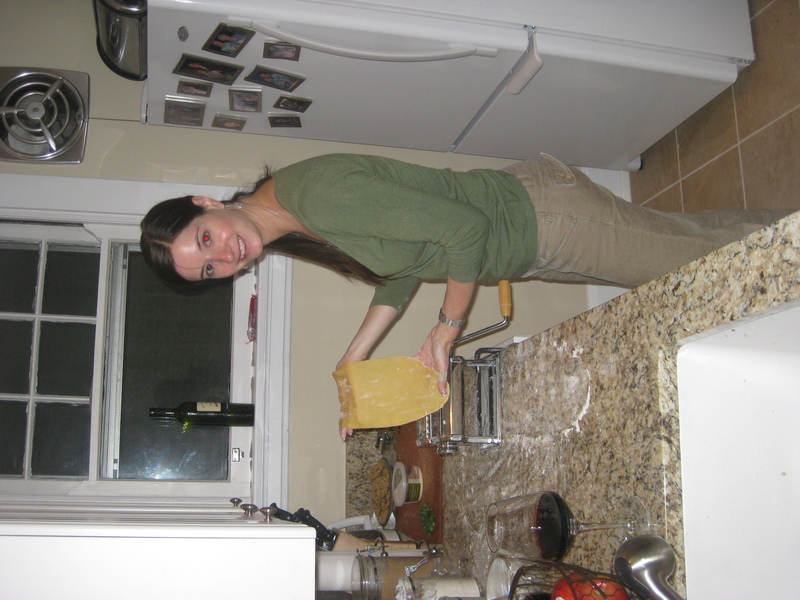 As you may know by now, every Thursday my husband and I have “pasta and wine night.” It is a treat because I am only allowed to make pasta once a week (per my healthier husband) and we get a glass of wine to celebrate the start of the weekend the next day. In the summer it is tough to find pasta that feels right for the hot, sticky nights. No 5-hour tomato sauce, no baked ziti, no homemade macaroni. So, I am on a constant search for summer pasta. I found this one in Food & Wine (by Michael White) and thought it looked light, yet flavorful. I was also curious about the chicory/escarole because I will admit, I had actually never cooked with it before. I also thought the mint was an interesting twist…I always trust Food & Wine, so I thought we should give it a try. The sauce is light – the chicken broth melds with the sausage drippings and olive oil into a flavorful coating. The escarole adds a nice flavor (and healthy component). And the mint, just seems to work – can’t describe why! So, I recommend making this one on a hot summer night when you want some light pasta without sacrificing the flavor. I know we will eating this one a few more Thursdays this year! In a large pot of boiling salted water, cook the pasta until al dente. Drain well. Meanwhile, in a large, deep skillet, heat 2 tablespoons of the olive oil until shimmering. Add the sausage and cook over moderately high heat, breaking it up with a wooden spoon, until browned, about 7 minutes. Using a slotted spoon, transfer the sausage to a plate. Add the garlic, crushed red pepper and the remaining 2 tablespoons of olive oil to the skillet and cook until fragrant, about 1 minute. Add the chicory with any water clinging to the leaves and season with salt. Cover and cook until wilted, about 2 minutes. Uncover and cook until the chicory is tender and the liquid has evaporated, about 5 minutes longer. Add the pasta to the skillet along with the sausage, chicken stock and pecorino and cook over moderate heat, stirring constantly, until the liquid is slightly reduced and creamy, about 3 minutes. Stir in the mint and serve right away, passing extra cheese at the table. It isn’t a surprise that when we were in Italy we tried to bring back some food. Some things were difficult like olive oil and balsamic vinegar (and unfortunately wine), but we did run into a plethora of spices when we were in the Cinque Terre. They were so simple – a bag of a unique blend of spices that you cook with olive oil to infuse it, then toss with pasta and top with cheese. It seemed so simple, yet like everything we experienced in Italy, the simple foods were in so many ways the most amazing. So, we tried this at home with some bucatini and it was amazing. Perfect for summer, too, since it wasn’t too heavy. I know it might seem silly to blog this since the ingredients aren’t readily available here, but I will do two things to help. 1) I will translate the ingredients so you can make a similar spice mixture and 2) I will include the Web site of the company who makes the spies in the Liguri region (and I have an email into them to ask about shipping to the US). Boil water and cook pasta according to directions. Heat olive oil in skillet until it is hot but not smoking. Add the spices and cook on low-medium heat for a few minutes, until it is infused. Drain pasta and add to spice mixture. Toss to coat and top with cheese. As a seasonal cook, I fully realize it is way too early for this recipe. Asparagus is such a spring dish and the bright lemon and lack of a heavy sauce makes this perfect for warm weather. Perhaps making this dish is my way of having some wishful thinking, since it is only early March. However, this recipe will certainly be in my list of “light, warm-weather pastas.” I envision eating it with a light, crisp glass of white wine, sitting on my back patio in the warm evening. This time we had it inside on a Thursday night while watching TV, but hopefully it a month or two, we can give this dish the ambiance it deserves. Thanks to Cooking Light for this one – they have had a lot of great recipes lately. Once thing to note, a lot of recipes have me scratching my head – how is this cooking light? Take a minute and read the serving size and it will all be made clear to you. The challenge is always adhering to it, of course! SIDE NOTE: This was the first time I had ever baked pancetta, and oh my goodness – it gets extra crispy and has a concentrated flavor! You could always throw it on the stove with oil, if you wanted, but I recommend giving the oven a try. 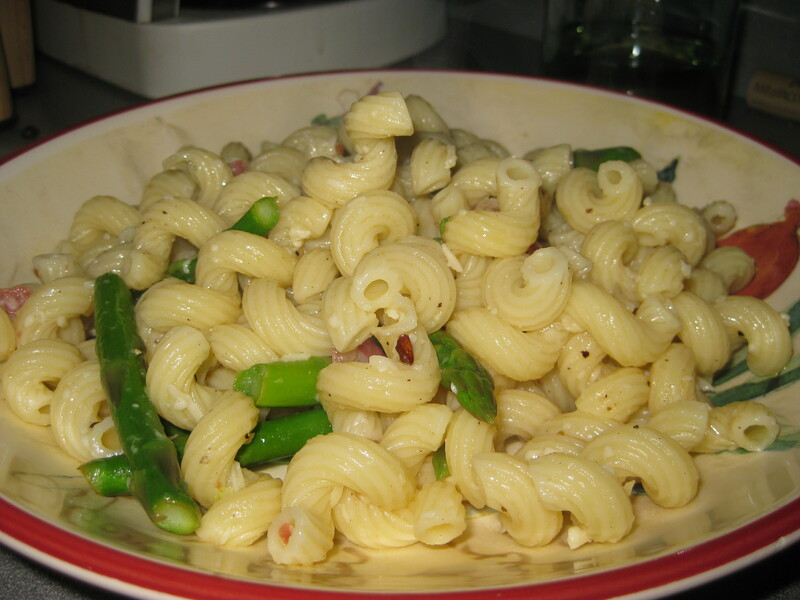 Cook pasta according to package directions, omitting salt and fat; add asparagus to pan during last 3 minutes of cooking. Drain. 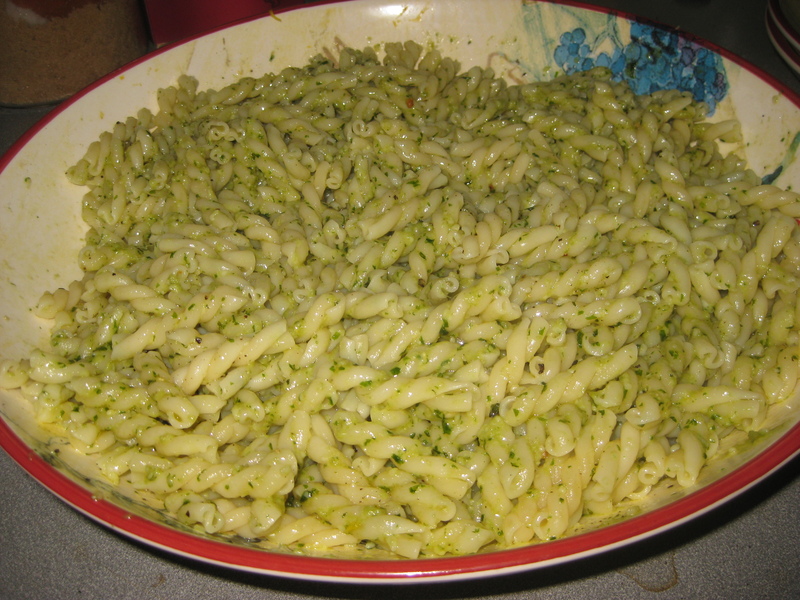 Sprinkle pasta mixture with garlic; return to pan, and toss well. Arrange pine nuts in a single layer on a jelly-roll pan. Bake at 400° for 3 minutes or until golden and fragrant, stirring occasionally. Place in a small bowl. Increase oven temperature to 475°. Arrange pancetta on jelly-roll pan. Bake at 475° for 6 minutes or until crisp. Combine lemon juice, olive oil, salt, and pepper, stirring with a whisk. Drizzle over pasta mixture; toss well to coat. Sprinkle with pine nuts, pancetta, and cheese.